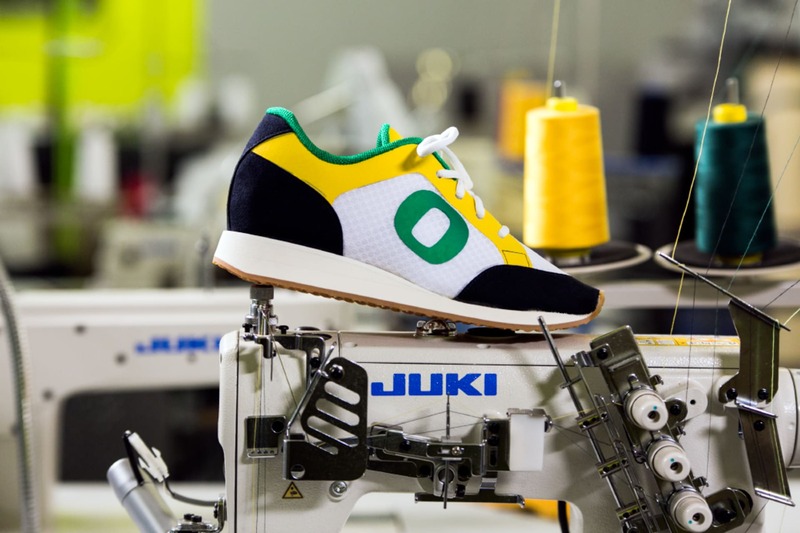 University of Oregon’s footwear-making workshop teaches you the basics of crafting sneakers bit-by-bit. Here’s what happens inside the classroom. University of Oregon "OShoe" sneaker. All images courtesy of In the Flicker. It’s an early Monday morning, but there’s a definite energy in the room. It’s one that’s alert and awake—and, more importantly, it’s an energy that’s contagious. The setting is one that’s unlike your typical college classroom at nine in the morning. I’m on the University of Oregon’s Portland campus, in the historic White Stag Building beneath the city’s famous “Portland, Oregon” light-up sign that greets all that cross the Burnside Bridge. For the next five days, I’m a student, learning the ins and outs of footwear making as part of an orientation workshop offered to the university’s inaugural Sports Product Management master&apos;s class. I was invited by Ellen Schmidt-Devlin. As a former Nike employee of 27 years who led product development, Schmidt-Devlin got her start at the company working under Nike co-founder Bill Bowerman, who was also her track coach at the University of Oregon, where she would eventually compete in the 1980 Olympic trials. It’s this same competitiveness and drive that carried over from the track to Nike that’s led to her current path as a director of the Sports Product Management master&apos;s program. “We imagine a world where we develop new talent for this industry,” she says. Developing that talent of future leaders starts with the basics, and for the next 18 months, the program will take its students on an immersive journey as they earn their Master of Science in Sports Product Management. It’s a comprehensive, hands-on program that brings students to Portland, arguably the country’s epicenter of sports products and performance gear with companies like adidas, Nike, and Columbia Sportswear just a few miles from campus. Students will get an insider’s knowledge on the entire lifecycle of sports products—footwear, apparel, and equipment. It starts with initial ideation and strategy, as students take classes in marketing research, consumer insight, and human physiology in relation to athletic performance and product. The next part of the program focuses on operations and management. By the end of the program, students will have formed groups and developed a product of their own to present to industry professionals. “This is not my work. This is my passion,” Marenghi says, matter-of-fact, to the classroom of 38 students. The upper draped on a last. It’s a passion that earned Marenghi a reputation as a master in footwear, leading training sessions at companies like Nike and New Balance. Hailing from Italy, Marenghi started his career in footwear in 1985, learning the trade at his family’s factory, which made classic men’s shoes. It’s this knowledge of shoemaking that he wants to share to the students. “My personal goal is the students have to really understand how many steps, how many issues, and how much fun it is to be able to create and make something,” says Marenghi. Each day of the workshop introduces a new step of the footwear making process: theories like the fundamentals of shoe design, material cutting, size grading, and types of performance footwear and construction. As we learn on day one, the first step behind every sneaker starts with lasts—the foot-shaped mold that goes into creating each shoe. When it comes to footwear making, the last comes first, and no sneaker can be made without one. Tools and partially completed upper on a cutting mat. The sneaker we’re creating is the “OShoe.” It’s a running silhouette done up in Oregon’s signature bright green/yellow school colorway and finished off with the “O” logo on the quarter. To the initiated, it bears resemblance to a vintage Nike runner. During the morning lectures, Marenghi covers the different parts of the shoe, the technical jargon of footwear-making a native language to him. Most of the terms are recognizable to anyone who’s ever watched a sneaker unboxing video, and it’s easy to identify the different parts of the pattern traced on the last: midsole, outsole, medial, lateral, upper. But, as we quickly learn, it’s putting together the final product that proves to be a challenge. The actual shoemaking takes place at the White Stag Innovation Lab, a renovated space just a stone&apos;s throw away from our classroom across the street. One side of the lab is lined with tough work benches made of maple tops and steel legs. The other side of the room is filled with industry-standard machinery. There are various sewing machines based on desired stitch. A 3D printer. A strobel. This is the space where we put all the theory that was drilled in our heads in the morning into use. Making a shoe is like working on a puzzle that you have to create from scratch: each piece must be measured to fit perfectly with the other, then put together precisely. I’ve partnered with 26-year-old Andrew Hamburg from Phoenix, Ariz. Hamburg is a former professional hockey player—one of a handful of students in the class who played sports at the collegiate level—a role that gave him an understanding of the way sports equipment works and the unique way gear wore down depending on individual players. “Being a high-level athlete and a high-level consumer, you have some insights,” he says. Watching Marenghi in the lab is like witnessing a doctor perform surgery. His technique is confident, precise and almost effortless. As he demonstrates how to cut patterns, he has an X-Acto knife in one hand while the other hand anchors the pattern. His shoulders are squared and his feet are planted firmly to the ground. He wastes no motions, and each movement exact but efficient. We watch in awe, absorbing as much as we can before tackling the same tools and patterns on our own. Making a shoe is like working on a puzzle that you have to create from scratch: each piece must be measured to fit perfectly with the other, then put together precisely. One misstep—an incorrect measurement, a hasty stitch, a sloppy pattern—can ruin the entire process. We work carefully, slightly hesitant but eager nonetheless, as Marenghi guides us through the process. The next step is to trace each pattern onto the fabric, a synthetic suede and 3D mesh foam for the upper. Then comes the most difficult part of the lab: cutting each piece from the fabric. Though our efforts understandably pale in comparison to Marenghi’s, we persevere with each step. Stitching the collar lining to the upper. “It’s been intense,” says Mary Sabino, a 27-year-old who has a background in hospitality management and previously worked retail at Nike in San Ysidro, Calif. Being in the lab shows just how much work goes into creating a quality sneaker by hand. As we learn from Marenghi, making a handcrafted shoe is an art. It’s one that requires skill and knowledge, plus plenty of time and labor. For a culture of sneakerheads who are quick to complain about factory defects on a general release sneakers—or even the high price of a designer sneakers—it’s eye opening to see the entire process behind a quality product. Naturally, the program attracted its fair number of sneakerheads—these were the students in Air Jordan retros, limited Nikes, and jogger pants. For many of those who spent days scrolling through forums and nights camping out for big releases, turning a love of sneaker culture into a serious career seems like a pipe dream. But the program helps make dreams into reality, as students take corporate field trips and learn from a faculty of industry insiders that include Nike alum Mike Friton, who will join Schmidt-Devlin’s as a guest instructor. Patterns and "OShoe" sneaker samples. Like Schmidt-Devlin, Friton ran track for Bill Bowerman, and he eventually transitioned into a 30-year career at Nike as a part of its design team. Friton was one of the founding members of its legendary Innovation Kitchen and helped with the creations of numerous products, including the Air Woven, Presto, and what would eventually become the FLYEASE. Perhaps his biggest contribution to the Swoosh is the auto-lacing technology intended for the Nike Mag—Friton, along with Tinker Hatfield and Tiffany Beers, is listed as an inventor on the official patent. 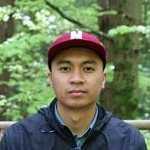 Friton will teach students about creating prototypes, and his open teaching philosophy emphasizes maximum creativity. "I leave their concept of what they want to build up to them,” he says. “I want them to have tools to create whatever it is they envision." For sneakerheads, the program is a step closer to making what some might call a hobby into a legitimate career specialty. Jordan Houston left his job at Champs Sports corporate as a merchandiser to join the program. Houston is one of the students who discovered the program through an article I wrote back in March for Complex. A few months later—plus an application, personal essays and an interview—Houston made the cross-country move from Florida to Oregon in order to advance his skill sets. “[I wanted to] invest in my future and get a master&apos;s degree in something that I’m actually interested in, which is sneakers and athletic footwear and apparel,” says Houston, who was wearing “Legend Blue” Air Jordan IVs when I spoke with him. A closer look at the heel counter and backstrap. Like Houston, Sarah Nazim also had experience in the corporate side of sportswear. The 25-year-old grew up in Malaysia and earned a marketing degree from the University of British Columbia. Following her undergraduate studies, she interned at adidas’ global HQ in Germany and eventually landed a job as a marketing coordinator for Native Shoes. Seeing the big picture is important to Nazim. The program’s holistic approach to the industry appealed to her—understanding the entire product process means understanding how a decision for one team can affect all the other teams down the entire product line. Lateral side of the "OShoe" sneaker. The world of sports product management is bigger than sneakerheads and most certainly doesn’t just mean footwear. There’s also athletic gear, outdoor equipment, and the burgeoning field of wearables, and with each field comes its own set of careers and concentrations. That’s clear enough with this inaugural set of students, each with their own work experiences and interests. The result: a mixed set of students learning and working together cross-functionally. During the development stages of the program, Schmidt-Devlin says, the university conducted an assessment with industry insiders for feedback. “The number one thing that we heard from the industry is teach your business people how to work with design and then turn it around and teach designers how to work with business people,” she says. This multi-faceted dynamic is one familiar to student Michael Harris. As a former U.S. Army officer, Harris was stationed in Korea, Iraq, Qatar and Afghanistan. “Every officer in the army is expected to come in knowing how to be part of and lead a multi-functional, multi-disciplinary team,” he says. 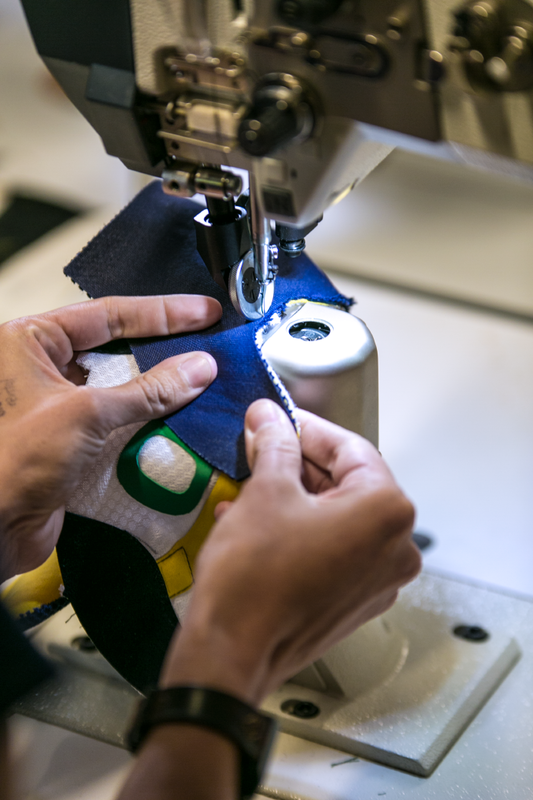 It’s this innovative way of thinking the the industry is looking for, and one that the University of Oregon looks to encourage and nurture with its Sports Product Management program. The workshop is a reflection of the program’s holistic approach to learning—rooted in theory, classroom learning, and hands-on practical application. It’s designed to show its students all aspects of sports product management, from production, development and operations to business strategy and marketing tactics. And with its cohort set-up—students take all of the same classes through the entire program—students receive an overall understanding of the industry. At the end of the program, each student will leave with a well-rounded perspective of the sports product industry as a whole. Schmidt-Devlin agrees. Developing a solution to a problem—or improving on existing solutions—is the core of the program, and it’s more than a sneak peek of the industry. To her, the most important part is to foster forward-thinking leaders, teaching students how to think creatively and strategically. But that’s still decades away. For now, we’ve still got a sneaker to finish. We fuse and stitch and assemble, but it’s not until the fourth day of the workshop that we finally see the shoe coming together. We take our samples back to the lab tables. We admire the fully formed medial and lateral sides, and drape the sample on the last. It looks like an actual shoe. It’s not quite perfect, to be sure—it’s just a prototype, after all—but it’s just the start of something bigger to come. As the first class, there’s a certain pressure to set the bar for future classes in this master’s program. They could be the ones that future catalogs will reference, the ones that prospective students will admire, the ones who will make that successful leap from alum to industry leader. At the end of the 18 months, the class of 2017 can look back and think that its future all started with a custom-made sneaker. White Stag Innovation Lab workspace.